Barron’s, a financial and investment magazine under Dow Jones Media Group, has redesigned its website, inspired by the clean and direct nature of newsletters. The homepage design features "The Brief" at the top to tell readers “how to think about today and forecasting tomorrow," Daniel Bernard, senior vice president of Barron's, told Publishers Daily. It summarizes the market news of the day and what it means for the future, with bullet points and headlines for readers to click to read deeper, much like a newsletter. It is part of a larger move to improve the Barron’s homepage. Brighthouse Financial is one of Barron’s launch partners for the redesign. The nearly 100-year-old title has over 500,000 subscribers, mostly comprised of wealthy, professional investors. Online, its content is behind a paywall — the minimum number of articles a reader can consume is based on an algorithm, a flexible wall that spans across all of Dow Jones’ publications. “The Dow Jones Media Group is reimagining legacy brands and bringing them to the modern age,” Almar Latour, publisher of Dow Jones Media Group, told Publishers Daily. The goal of the Barron’s redesign is to “grow membership, grow advertisers, and grow audience,” he added. The redesign team found readers wanted more information on emerging technology “driving disruption, and what that means for your investments, your investing strategy or how you are advising your clients,” Bernard explained. Editorial is now organized by “interests,” which are “more granular” than sections, Bernard said. “Technology” and “sustainable investing” are two of the interests listed. Topics can be added and tweaked based on what news is trending. Readers will notice substantially fewer images on the new Barron’s site. The team found that using stock photography for financial news (generic images of rising stocks) did not drive engagement from its audiences. The result is a decluttered, less noisy page; the trimming down of columns also gives the homepage a cleaner look. Less artwork means more focus on the headlines, and any original photography Barron’s has. Cleaning up the site does not affect Barron’s online ad inventory online. 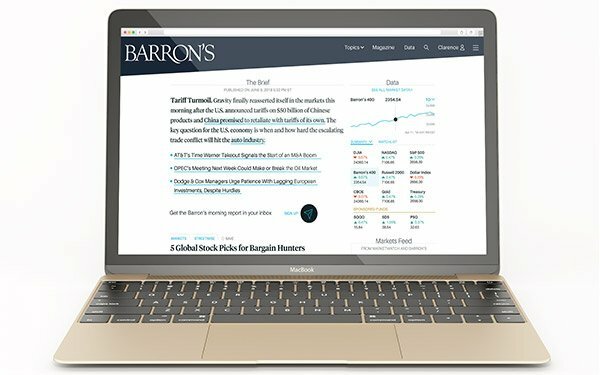 The Barron’s logo and navigation menu now sit in the “wedge.” The full-bleed header shape can feature a flexible ad that moves with the browser size, and also has the ability to push down or takeover the page. A new “Sponsored Funds” section underneath the market data widget of the site “puts the product in front of users" with a ticker for sponsored products. It acts like a native, product placement, Bernard said. Barron’s also got rid of its infinite scroll feature, a popular way for publishers to serve its readers article after article. Instead, readers are given packages of about eight-to-10 articles on news related to the original article they clicked on - a continuous, finite news scroll, integrated with native advertising. Barron’s will also roll out digital covers. The bold, print-like cover story, image and headline will bring attention to its weekend edition and feature stories. “When the market is closed on the weekend, we know our readers like to take the time to consider issues more deeply and think about the big picture, so we made the weekend experience a lot more immersive,” Bell said. Digital covers are a full-bleed banner photo and headline across the top of the site, with an “Open” button that pushes down the rest of the homepage with the article. Once a reader is finished, they can “X” out of the story, and get right back to where they were on the original page. Dow Jones Media Group oversees the luxury and financial titles Barron's, MarketWatch, Mansion Global and Financial News, as well as Penta, the luxury lifestyle accompaniment to Barron’s. Created in 2016, Dow Jones Media Group acts like the start-up arm of Dow Jones, with more room to innovate, experiment and test ideas for digital growth. The Dow Jones Media Group was behind the recent launch of millennial personal finance brand Moneyish.